Other versions: CPC; AMI; AST. 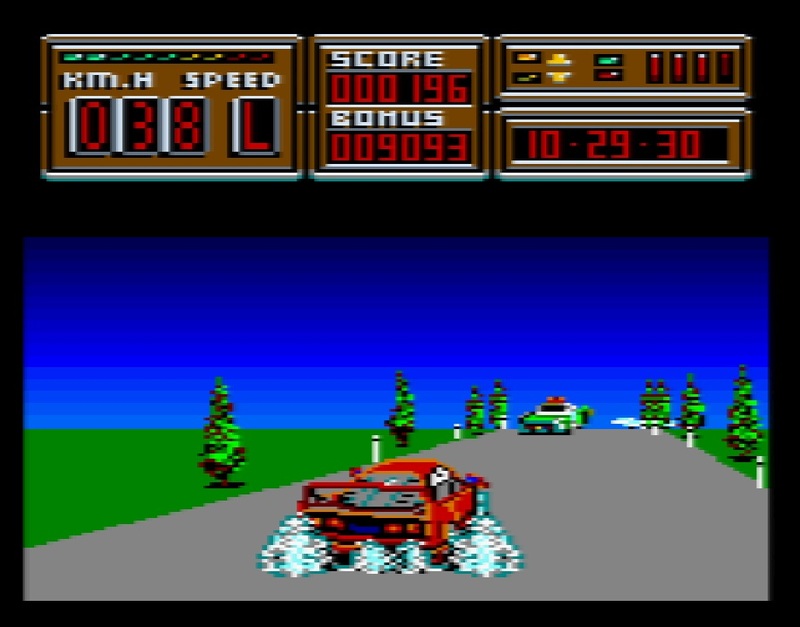 Alongside the pack-in racer Burnin’ Rubber, Crazy Cars 2 was one of the more available titles for the GX4000. It’s another ported cartridge of the CPC version, merely using the extended colour palette to inject a tiny bit of boost into it. It’s common knowledge at the turn of the 1990s, Ferrari’s were the teenage boy’s choice of wet-dream car, so like Outrun with its Testarossa, Crazy Cars 2 is blessed with one of the best supercars ever made, the F40. But just because this beast of a vehicle is outstandingly pleasing to cast your peepers upon, did it make the transition to 8-bit with its entire aesthetic greatness and wow factor intact? Looks-wise it didn’t do a bad job to be fair, but like the sparseness of the F40’s interior, this checkpoint runner is missing many vital aspects, making it nothing more than a brief and laborious spin for cheap kicks, as unlike driving a real supercar on the highways of the US, here tedium quickly sets in. At first, the outward premise of Crazy Cars 2 sounds rather insightful and appealing. Without the aid of a modern day sat-nav, directional assistance is provided only by the helpful HUD, you are tasked to reach a finish line in the time allocated via you own route. You accomplish this by consulting an in-game map of four states of western America. Your aim is to get to your destination as quickly as possible, avoiding both the corrupt squad cars and real police in the process. There is a thin plot outlined in the instructions about a stolen car heist, that for some reason a vigilante loon (that’s you) in an F40 has to stop. This is pure hokum and not referenced in the game at any point; so all you need to worry about is getting to your checkpoint with minimal complications. Coincidently, minimal is a very apt description for this game. 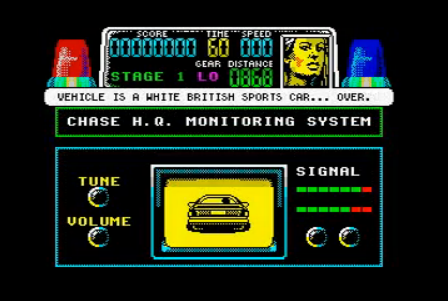 Whilst driving an Italian classic, cutting up the rozzers and reaching speeds of 200mph may sound like good fun, it is all scrubbed out by the lack of visual detail, invulnerability to damage and nominal longevity. The problem here is uncomplicated. There is just so little environment presented in the game, and this has a knock-on effect on the enjoyment and gameplay overall. While not bad in themselves, the graphics are just so meagre in terms of content, it turns a potentially pleasurable joyride into a monotonous trek over many empty roads. The road, surrounding landscapes and horizon details are portrayed in drab, solid block colours with no gradient, they are unchanging and don’t create that all-important sense of speed that is essential in racing games of any kind. The roadside furniture is repetitive, unexciting and scrolls slightly jerkily, there are no obstacles other then the odd police roadblock to negotiate, and most importantly; no other cars on the road! This doesn’t bode well; the roads themselves are supposed to be based off the real-life routes, so immediately this becomes a humdrum task of driving on mostly empty tarmac, provide little to actually do apart from navigating your route. For instance, Chase HQ would be an example of the era to illustrate traffic. Also, you appear to be driving an endlessly re-spawning car. When you hit something and explode, you are simply dropped back on the course like nothing happened. You lose a bit of time, but there is no limit on the number of times you can perish. This, predictably, removes a large amount of the challenge. Nevertheless, grudgingly squinting past these serious faults, there are a few nice aspects to driving around the Midwest in Crazy Cars 2. From what little there is of them, the vehicle sprites are well done. The F40 in particular looks great, especially when you spin out. 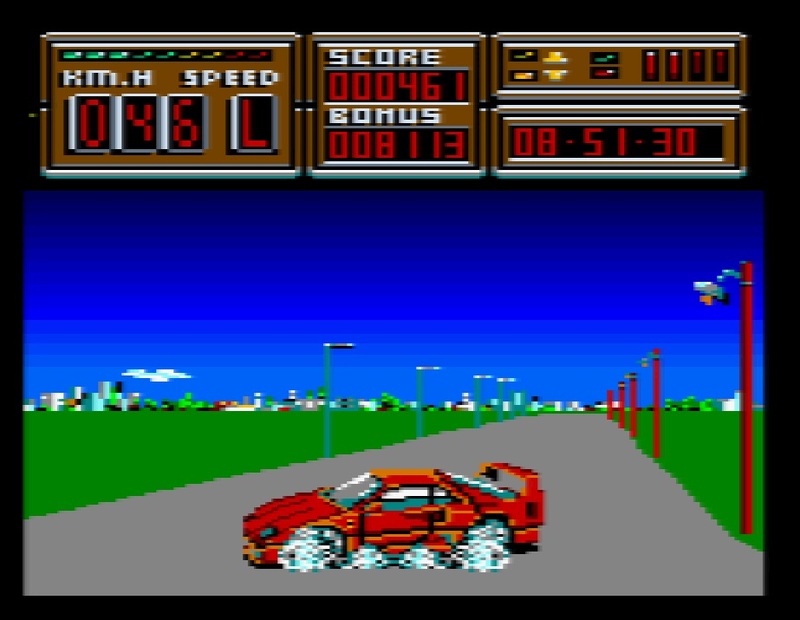 The police cars are okay too, and present themselves nicely on-screen with good scaling. The best visual facet of the game is the clever depiction of the road’s twists, turns, junctions and undulating surface. It may not feel that fast due to the disappointing supporting milieu, but it is incredible smooth and slick, thankfully giving at least some sensation of haste. It also has responsive, sharp controls. Breaking, accelerating and turning is easy and obedient, although the latter is very limited at high speeds and more free when dropping down to the low gear. This is due to an odd game mechanic in the way your car is controlled. It takes a little getting used to, but the arcade style hi-lo gear system and somewhat inconsistent steering can be worked with practice. In a way, this brings even more annoyance, because just a little texturing to the road surface, some distant particulars or any other themed obstacles would have made this far better. The CPC’s Buggy Boy managed to do this to great effect. To add further displeasure, there are no boosts, power-up icons or upgrades to speak of, adding to the general woefulness. Weirdly, although you are permitted to drive off-road, you cannot stay on the verge for long without exploding, and you can’t turn around either. This is maddening because missing a junction results in you having to traverse yet more endlessly vacant roads to get back on target. 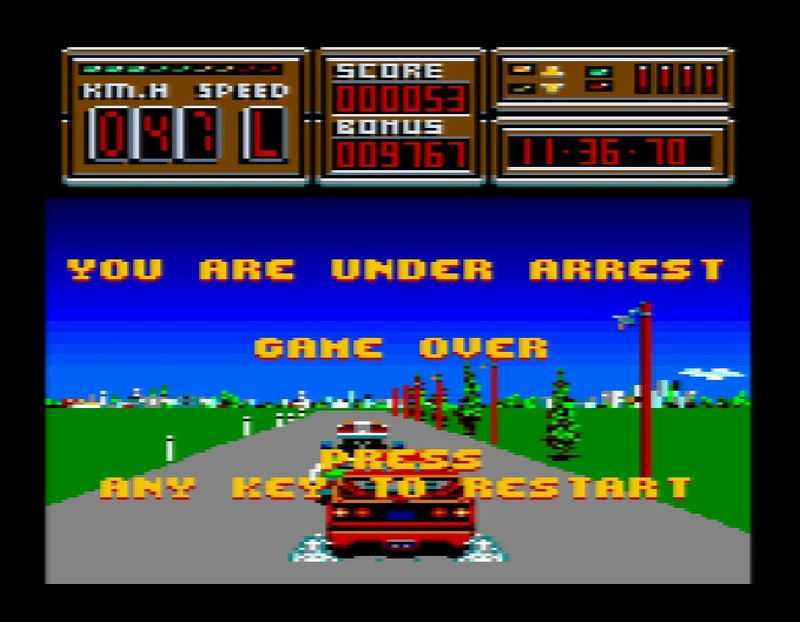 In a direct comparison to Burnin’ Rubber, the crash sequence is outright appalling; your car simply explodes upon any sustained impact, and it just so happens that the police cars, while rather clever at blocking your moves, are completely indestructible. Stupid! ...Before aquaplaning on said wave and ending up facing backwards. Boo. Right, I’m digressing into negativity again, so I’ll try to end on a positive note. Something which doesn’t turn the ’crazy’ moniker into crap is the audio. The pleasant but average title theme is pretty good as heard on the impressive title screen. The in-game BGM is also passable, but the SFX are far better. A good but tinny engine tone rises well, the crash hits sound authentic even though there is no tyre squeal sounds. The standout acoustics come from the police cars. A clever doppler effect is utilised to fade the sirens from distance, and also from behind your vehicle out of shot. This does assist the gameplay vastly, as you can anticipate an approaching squad car via the volume and tone of the sound. This method doesn’t crop up to often in 8-bit games, so it’s reassuring to see it used and implemented well here. 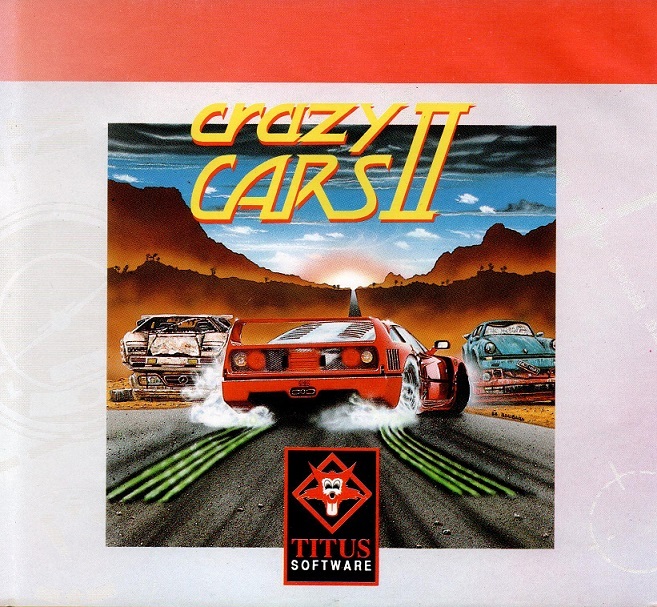 With a bit of thought put into the sprawling highways and vacant countryside, Crazy Cars 2 may have been a pretty good little run-around. It poses a nice idea in plotting your own route, and this could have been a satisfying challenge if it wasn’t for empty roads, unyielding police vehicles and infinite lives, not to mention the severe movement restrictions. It’s bright for sure and uses the extra colours well; the sky is very nice for example. But it really doesn’t match up to other class racers of this era neither in graphics nor gameplay. Aside from the neat audio snippets, this is a forlorn, sub-standard game and not ‘crazy’ in any shape or form.